2009-11-30 First worldwide family litigation filed litigation Critical https://patents.darts-ip.com/?family=26961283&utm_source=google_patent&utm_medium=platform_link&utm_campaign=public_patent_search&patent=US20030206956(A1) "Global patent litigation dataset” by Darts-ip is licensed under a Creative Commons Attribution 4.0 International License. 2015-06-11 Assigned to INSITE VISION INCORPORATED reassignment INSITE VISION INCORPORATED INTELLECTUAL PROPERTY SECURITY AGREEMENT Assignors: QLT INC.
2015-09-16 Assigned to INSITE VISION, INC. reassignment INSITE VISION, INC. RELEASE BY SECURED PARTY (SEE DOCUMENT FOR DETAILS). Assignors: QLT INC.
2015-11-17 Assigned to INSITE VISION INCORPORATED reassignment INSITE VISION INCORPORATED RELEASE BY SECURED PARTY (SEE DOCUMENT FOR DETAILS). Assignors: RANBAXY, INC. The topical application of an azalide antibiotic such as azithromycin to the eye is useful in treating or preventing ocular infections. In one embodiment, the azalide antibiotic is supplied to the eye in a depot for sustained release. A more convenient dosing regimen can also be provided by the use of an appropriate depot. Furthermore, a composition containing a combination of medicaments is also provided. This application is a continuation of prior U.S. patent application Ser. No. 09/767,943, filed Jan. 24, 2001, now allowed, which is continuation of U.S. patent application Ser. No. 09/346,923, filed Jul. 2, 1999, which is a continuation-in-part of prior U.S. patent application Ser. No. 09/282,165, filed Mar. 31, 1999, the entire contents of which are incorporated herein by reference. R 1 and R2 each independently represent a hydrogen atom or a methyl group. Preferably at least one of R1 and R2 is a hydrogen atom. Azithromycin, the common name for N-methyl-11-aza-10-deoxo-10-dihydroerythromycin, corresponds to the compound of formula (1) where both R1 and R2 are a hydrogen atom. Azithromycin was disclosed in U.S. Pat. Nos. 4,474,768 and 4,517,359, the entire contents of each patent being incorporated herein by reference, and is the most preferred azalide antibiotic. In particular, the dihydride form of azithromycin is especially contemplated for use in the present invention, although other forms are also suitable. The amount of azalide antibiotic topically supplied is effective to treat or prevent infection in a tissue of the eye. This means that the conditions of application result in a retarding or suppression of the infection. Typically at least about MIC 50 for the targeted bacteria or parasite is delivered to the ocular tissue by the topical application of an effective amount. More concretely, the concentration within the ocular tissue is desired to be at least about 0.25 μg/g, preferably at least 1 μg/g, and more preferably at least 10 μg/g. The amount of azalide actually supplied to the external eye surface will almost always be much higher than the tissue concentration. This reflects the penetration hold up of the azalide antibiotic by the outer tissue layers of the eye and that penetration is to some extent concentration driven. Thus, supplying greater amounts to the exterior will drive more antibiotic into the tissues. More generally, the azalide antibiotics can be used to treat or prevent ocular infections caused by a variety of bacteria or parasites, including but not limited to one or more of the following organisms: Staphylococcus including  Staphylococcus aureus and Staphylococcus epidermidis; Streptococcus including Streptococcus pneumoniae and Streptococcus pyogenes as well as Streptococci of Groups C, F, and G and Viridans group of Streptococci; Haemophilus influenza including biotype III (H. Aegyptius); Haemophilus ducreyi; Moraxella catarrhalis; Neisseria including Neisseria gonorrhoeae and Neisseria meningitidis; Chlamydia including Chlamydia trachomatis, Chlamydia psittaci, and Chlamydia pneumoniae; Mycobacterium including Mycobacterium tuberculosis and Mycobacterium avium-intracellular complex as well as atypical mycobacterium including M. marinum, M. fortuitm, and M. chelonae; Bordetella pertussis; Campylobacter jejuni; Legionella pneumophila; Bacteroides bivius; Clostridium perfringens; Peptostreptococcus species; Borrelia burgdorferi; Mycoplasma pneumoniae; Treponema pallidum; Ureaplasma urealyticum; toxoplasma; malaria; and nosema. Accordingly, the use of a depot more easily facilitates loading of the ocular tissue in view of the typically slow and low penetration rate of the generally water-insoluble/poorly soluble azalide antibiotics. The depot can effectively slowly “pump” the azalide antibiotic into the ocular tissue. As the azalide antibiotic penetrates the ocular tissue it is accumulated therein and not readily removed due to its long half-life. As more azalide antibiotic is “pumped” in, the tissue concentration increases and the minimum inhibitory concentration threshold is eventually reached and/or exceeded, thereby loading the ocular tissue with azalide antibiotic. By significantly exceeding the MIC 50, more preferably the MIC90 level, provided the toxicity limit is not exceeded, a therapeutically effective concentration will remain active in the tissue for an extended period of time due to the low clearance rate of the azalide antibiotic from the tissue. Thus, depending on the depot, one or two applications may provide a complete dosing regimen. Indeed, such a simple dosing regimen may provide a 6 to 14 day treatment concentration within the ocular tissue. A preferred dosing regimen involves one to two doses per day over a one to three day period, more preferably one or two doses in a single day, to provide in vivo at least a 6 day treatment and more typically a 6 to 14 day treatment. Such polymers may be crosslinked by a polyfunctional crosslinking agent, preferably a difunctional crosslinking agent. The amount of crosslinking should be sufficient to form insoluble polymer particles, but not so great as to unduly interfere with sustained release of the azalide antibiotic. Typically the polymers are only lightly crosslinked. Preferably the crosslinking agent is contained in an amount of from about 0.01% to about 5%, preferably from about 0.1% to about 5.0%, and more preferably from about 0.2% to about 1%, based on the total weight of monomers present. Included among such crosslinking agents are non-polyalkenyl polyether difunctional crosslinking monomers such as divinyl glycol; 2,3-dihydroxyhexa-1,5-diene; 2,5-dimethyl-1,5-hexadiene; divinylbenzene; N,N-diallylacrylamide; N,N-diallymethacrylamide and the like. Also included are polyalkenyl polyether crosslinking agents containing two or more alkenyl ether groupings per molecule, preferably alkenyl ether groupings containing terminal H 2C═C<groups, prepared by etherifying a polyhydric alcohol containing at least four carbon atoms and at least three hydroxyl groups with an alkenyl halide such as allyl bromide or the like, e.g., polyallyl sucrose, polyallyl pentaerythritol, or the like; see, e.g., Brown U.S. Pat. No. 2,798,053, the entire contents of which are incorporated herein by reference. Diolefinic non-hydrophilic macromeric crosslinking agents having molecular weights of from about 400 to about 8,000, such as insoluble di-acrylates and polyacrylates and methacrylates of diols and polyols, diisocyanate-hydroxyalkyl acrylate or methacrylate reaction products of isocyanate terminated prepolymers derived from polyester diols, polyether diols or polysiloxane diols with hydroxyalkylmethacrylates, and the like, can also be used as the crosslinking agents; see, e.g., Mueller et al. U.S. Pat. Nos. 4,192,827 and 4,136,250,the entire contents of each Patent being incorporated herein by reference. The compositions used to topically deliver the azalide antibiotic of the present invention can be prepared from known or readily available materials through the application of known techniques by workers of ordinary skill in the art without undue experimentation. The azalide antibiotics used in the present invention are commercially available or readily obtained by a worker skilled in the art through known reactions techniques. In particular, the azalide antibiotics can be formed from erythromycin A, a naturally occurring compound formed during the culturing of a strain of  Streptomyces erythreus. However, it is not required that the azalide antibiotic actually be formed from erythromycin. The azalide antibiotic can be combined with the other ingredients in the chosen dosage form by conventional methods known in the art. All of the percentages recited herein refer to weight percent, unless otherwise indicated. The following non-limiting examples serve to illustrate certain features of the present invention. The compositions and amounts used for Examples 1-7 are summarized in Table 1 and for Examples 9-14 in Table 2.
topically applying an azalide antibiotic to an eye in an amount effective to treat or prevent infection in a tissue of the eye. 2. The process according to claim 1, wherein said topical application comprises supplying a depot of a composition containing said azalide antibiotic on the eye. 3. The process according to claim 2, wherein said depot is a composition selected from the group consisting of an aqueous suspensions, ointments, and inserts. 4. The process according to claim 2, wherein said topically applied depot remains for at least 30 minutes after administration. 5. The process according to claim 4, wherein said depot remains for at least 4 hours after administration. 6. The process according to claim 3, wherein said composition further comprises an additional medicament. 7. The process according to claim 6, wherein said additional medicament is selected from the group consisting of antibiotics, antivirals, antifungals, anesthetics, anti-inflammatory agents, and anti-allergic agents. 8. The process according to claim 1, wherein said depot is an aqueous polymeric suspension of said azalide antibiotic. 9. The process according to claim 8, wherein said aqueous suspension comprises water, 0.01% to 1.0% of an azalide antibiotic, and 0.1 to 10% of a polymeric suspending agent. 10. The process according to claim 9, wherein said polymer suspending agent is a water-swellable water-insoluble crosslinked carboxy-vinyl polymer. 11. The process according to claim 10, wherein the polymer is comprised of at least 90% acrylic acid monomers and 0.1% to 5% crosslinking agent. 12. The process according to claim 11, wherein the crosslinking agent is a difunctional crosslinking agent. 13. The process according to claim 12, wherein said crosslinking agent is selected from the group consisting of divinyl glycol, 2,3-dihydroxyhexa-1,5-diene, 2,5-dimethyl-1,5-hexadiene, divinylbenzene, N,N-diallylacrylamide, N,N-diallymethacrylamide, and mixtures thereof. 14. The process according to claim 11, wherein said polymer is a polycarbophil. 15. The process according to claim 11, wherein said polymeric suspending agent is contained in an amount of from about 0.5 to 1.2%. 16. The process according to claim 15, wherein said polymer has a monodisperse particle size distribution. 17. The process according to claim 16, wherein said azalide antibiotic is azithromycin. 18. The process according to claim 17, wherein said azalide antibiotic is azithromycin dihydrate. 19. The process according to claim 8, wherein said aqueous polymeric suspension further comprises an additional medicament. 20. The process according to claim 19, wherein said additional medicament is selected from the group consisting of amikacin, gentamycin, tobramycin, streptomycin, netilmycin, kanamycin ciprofloxacin, norfloxacin, ofloxacin, trovafloxacin, lomefloxacin, levofloxacin, enoxacin, naphthyridine, sulfonamides, polymyxin, chloramphenicol, neomycin, paramomomycin, colistimethate, bacitracin, vancomycin, tetracyclines, rifampins, cycloserine, beta-lactams, cephalosporins, amphotericins, fluconazole, flucytosine, natamycin, miconazole, ketoconazole, corticosteroids, diclofenac, flurbiprofen, ketorolac, suprofen, comolyn, lodoxamide, levocabastin, naphazoling, antazoline, and pheniramimane. 21. The process according to claim 1, wherein said eye is suffering from at least one condition selected from the group consisting of conjunctivitis, ophthalmia neonatorum, trachoma, corneal ulcers, keratitis, keratoconjunctivitis, endophthalmitis, infectious uveitis and combinations thereof, and said amount of said azalide antibiotic is therapeutically effective to treat said condition. wherein R1 and R2 each independently represent a hydrogen atom or a methyl group. 23. The process according to claim 22, wherein said azalide antibiotic is azithromycin. 24. The process according to claim 1, wherein said application provides a therapeutically effective concentration of azalide antibiotic within a tissue of the eye for at least 8 hours. 25. The process according to claim 24, wherein said application provides a therapeutically effective concentration of azalide antibiotic within a tissue of the eye for at least 12 hours. 26. The process according to claim 25, wherein said application provides a therapeutically effective concentration of azalide antibiotic within a tissue of the eye for at least 18 hours. 27. A process for treating ocular infection, which comprises topically applying an ophthalmic composition containing an effective amount of an azalide antibiotic to an eye suffering from infection once or twice a day for one to three days. 28. The process according to claim 27, wherein the total application of ophthalmic composition provides a 6 to 14 day treatment concentration within the ocular tissue. 29. The process according to claim 28, wherein the total application consists of one or two applications. 30. An aqueous polymeric suspension comprising water, 0.01% to 1.0% of an azalide antibiotic and 0.1 to 10% of a polymeric suspending agent. 32. The suspension according to claim 31, wherein said azalide antibiotic is azithromycin and is contained in an amount of 0.1 to 0.5%. 33. The suspension according to claim 31, wherein said polymeric suspending agent is comprised of at least 90% acrylic acid monomers and 0.1% to 5% crosslinking agent. 34. The suspension according to claim 30, wherein said azalide antibiotic is in suspension and said suspending agent is hydroxypropylmethylcellulose. 35. The suspension according to claim 30, wherein both the azalide antibiotic and the polymeric suspending agent are in suspension. 36. The suspension according to claim 30, which further comprises an additional medicament. 37. The suspension according to claim 36, wherein said additional medicament is selected from the group consisting of antibiotics, antivirals, antifungals, anesthetics, anti-inflammatory agents, and anti-allergic agents. 38. The suspension according to claim 37, wherein said additional medicament is contained in an amount of from 0.01 to 5.0%. 39. The suspension according to claim 36, wherein said additional medicament is selected from the group consisting of amikacin, gentamycin, tobramycin, streptomycin, netilmycin, kanamycin ciprofloxacin, norfloxacin, ofloxacin, trovafloxacin, lomefloxacin, levofloxacin, enoxacin, naphthyridine, sulfonamides, polymyxin, chloramphenicol, neomycin, paramomomycin, colistimethate, bacitracin, vancomycin, tetracyclines, rifampins, cycloserine, beta-lactams, cephalosporins, amphotericins, fluconazole, flucytosine, natamycin, miconazole, ketoconazole, corticosteroids, diclofenac, flurbiprofen, ketorolac, suprofen, comolyn, lodoxamide, levocabastin, naphazoling, antazoline, and pheniramimane. 40. A composition comprising an effective amount of an azalide antibiotic, and additional medicament, and an ophthalmically acceptable carrier. 41. The composition according to claim 40, wherein said azalide antibiotic is azithromycin. 42. The composition according to claim 40, wherein said additional medicament is selected from the group consisting of antibiotics, antivirals, antifungals, anesthetics, anti-inflammatory agents, and anti-allergic agents. 43. The composition according to claim 42, wherein said composition is fluid; said azalide antibiotic is contained in an amount of from about 0.01 to 2.0%; and said additional medicament is contained in an amount of from about 0.01 to 5.0%. 44. 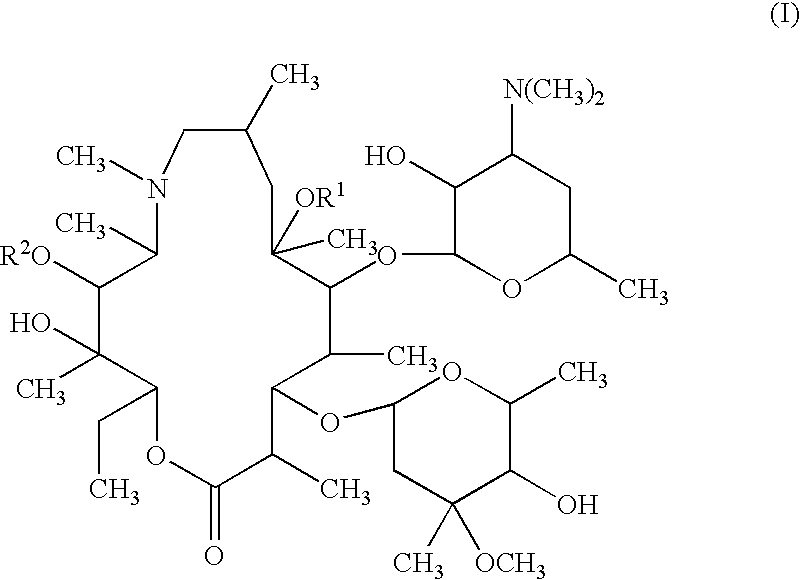 The composition according to claim 43, wherein said ophthalmically acceptable carrier is water or an aqueous solution and said additional medicament is selected from the group consisting of amikacin, gentamycin, tobramycin, streptomycin, netilmycin, kanamycin ciprofloxacin, norfloxacin, ofloxacin, trovafloxacin, lomefloxacin, levofloxacin, enoxacin, naphthyridine, sulfonamides, polymyxin, chloramphenicol, neomycin, paramomomycin, colistimethate, bacitracin, vancomycin, tetracyclines, rifampins, cycloserine, beta-lactams, cephalosporins, amphotericins, fluconazole, flucytosine, natamycin, miconazole, ketoconazole, corticosteroids, diclofenac, flurbiprofen, ketorolac, suprofen, comolyn, lodoxamide, levocabastin, naphazoling, antazoline, and pheniramimane. DE3851152T2 (en) 1987-09-03 1995-01-26 Univ Georgia Res Found Cyclosporine eye medium. ES2079320B1 (en) * 1994-05-17 1996-10-16 Cusi Lab Ophthalmic solution based on a diclofenac and tobramycin and applications. ES2316867T3 (en) 2009-04-16 Rimexolone use in the treatment of dry eye.